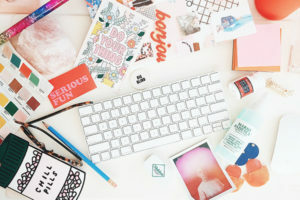 Ban.do is known across the country for empowering messages, all things pink and quirky illustrations from local artists, but it all started with a plan from Founder and Chief Creative Officer Jen Gotch. 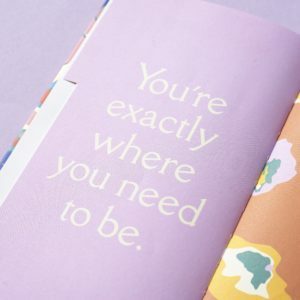 As a self-proclaimed non-planner, Jen understands the importance of planning and staying on track so she has surrounded herself with a supportive team. With that team, Jen was able to explore playful ideas and build an uplifting community into a fan-favorite brand. 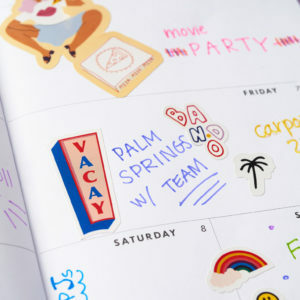 Ban.do wants life to be fun, offering an assortment of products from a day at the beach to working in the office, including the Paper Source exclusive 2018-2019 Ban.do Moonstone Planner. Learn more about Jen’s planning style and creative process in our interview below. What does your process for planning look like? Are you better at short-term planning or long-term planning? Why? If short-term planning includes planning what I am going to have for dinner when I’m eating lunch…I would say short-term. What did you like about the calendar or planner you chose? I can do you one better and tell you why we created a planner like the ban.do planner. We wanted covers that felt cheerful, optimistic, and motivational. We wanted beautiful, hand drawn art throughout, in order to shine a light on artists in our community while also inspiring the user with words and design. We wanted it to feel really useful, but also very personal, so we added handwritten compliments throughout and then in an effort to remind everyone that it is just as important to schedule FUN, we added “fun to-do’s” throughout. I’ll also say that choosing a favorite planner is always so hard for me, but that moonstone definitely has my heart. 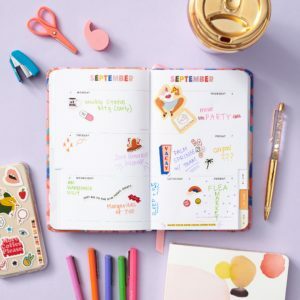 How do you accessorize your planner? Is it for personal style or functionality/productivity? I accessorize everything with stickers!! Always have, always will. What was your favorite part about back to school shopping growing up? I still have such a clear memory of the feeling of optimism and excitement I would get at the start of the new school year. New teacher, new friends, new classroom, new things to learn and NEW SCHOOL SUPPLIES. I would say the standout was choosing which Trapper Keeper to use and it almost always was the one with kittens on the cover. What office accessories are essential in a meeting? A great pen, I am a long time LePen lover, but also think our glitter bomb pen is awesome, as told by my previous answer, I prefer to hand write meeting notes rather than type them, so I always have either a pink legal pad or a large ban.do spiral notebook, and then a thermal mug full of Bulletproof Coffee and my iPhone! Do you have any organization hacks or tricks you can share? Outside of hiring someone to stay organized – which I’ve done – I would say organization at its core has to do with personal accountability. No matter what your system for staying organized is, you have to commit to doing what’s on the list. If something stays on my list for longer than a couple weeks, I reevaluate its importance. Would it be more chaotic losing your calendar for your personal/home life or work life? Why? Ten years into ban.do and I still struggle with work/life balance so the calendar is one and the same and it would be tough to lose. I actually think it would be the opposite of chaotic, because I would technically have “nothing on the calendar” so I could just lay in bed all day. What would your ideal desk and work space look like? I have worked in some really beautiful offices in the past, and the one we have now is pretty spectacular too, but for me the ideal workspace has more to do with how I feel than how it looks. When I am feeling clear-headed, focused and intentional about my work every space is the ideal space. The 2018-2019 Moonstone Orange Planner was featured in this post and you can find it here. You can also click here to learn more about all of our Planner Ambassadors.